According to the American Academy of Audiology, as of 2009, of the 315 million people in the United States, it is estimated about 36 million have hearing loss. Although hearing loss is often associated with aging, hearing loss is clearly present in newborns, children, teenagers, young adults and adults. Healthy human ears can perceive an enormous range of sounds in terms of pitch and loudness, and our hearing is the primary sense through which we learn speech and language. The ability to hear clearly from birth is extremely important with regard to normal development of speech and language skills, auditory processing skills, a sense of self, as well as normal emotional and psychological well-being and more. As we age, our ears are exposed to a lifetime of noises such as lawnmowers, telephones, industrial machinery, leaf blowers, chain saws, industrial noise, hair dryers, weapons, and recorded and live music. Many of these sounds occur at loud and potentially injurious levels. Although some people are born with hearing loss, many people will notice a gradual decline later in life. People may be born with, or acquire hearing loss for a number of reasons and may include a genetic predisposition, ear disease, noise exposure (including music, industrial, military and more), ototoxic medicines (medications that attack the hearing structures), head trauma, and others. The first category of hearing loss is the most common, called "sensorineural." 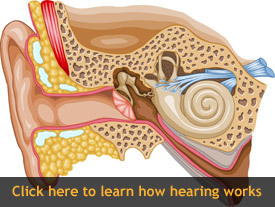 Sensorineural hearing loss occurs when tiny hair cells within the inner ear (the cochlea) are damaged. Sensorineural hearing loss is permanent and in most cases there are no medical or surgical treatment options. Hearing aids are the primary treatment for sensorineural hearing loss. In some situations, such as when hearing aids have not been beneficial for particular patients with severe and profound sensorineural hearing loss, these people may benefit from cochlear implantation. The most common sensorineural hearing loss is a high-frequency hearing loss, typically associated with aging or noise exposure, and often both. High-frequency hearing loss may be difficult for patients to "self-diagnose" because it occurs slowly over decades. Persons with high-frequency sensorineural hearing loss often note they can hear, but they cannot hear clearly. They may say "people don't speak as clearly as they used to…" These are common observations from people with high-frequency sensorineural hearing loss. The primary rehabilitative tool for these individuals is hearing aids. The second most common type of hearing loss is referred to as "conductive." Most often, conductive hearing loss results from a blockage of the normal air conduction sound pathways. Conductive hearing loss may be due to ear wax (cerumen) blocking the ear canal or perhaps a foreign object may be lodged in the ear canal. Another example of a conductive hearing loss is when fluid occupies the middle ear space, as might occur with common ear infections (otitis media). The third most common type of hearing loss is called a "mixed" hearing loss. As its name implies, it involves both sensorineural and conductive hearing loss components. In general, people with normal hearing (up to 25 dB hearing loss for adults, up to 15 dB for children) can hear most speech sounds in quiet and comfortable listening situations. For information regarding children with hearing loss, please see "Children and Pediatric Hearing Loss." Adults with moderate hearing loss (between 41 and 70 dB) miss a lot of speech sounds and telephone conversation. They often ask for repeats and often say, "What did she say?" If you think you may have a hearing loss, find an Audiologist and set up an appointment to have your hearing checked.